A popular D.C. spot for poetry, food, music and cultural gatherings is celebrating its 10th anniversary with renowned writers and revolutionaries. Busboys and Poets, a local chain of community restaurants/bookstores where local artists and activists can share their work, is throwing a birthday bash in Brookland Oct. 2. 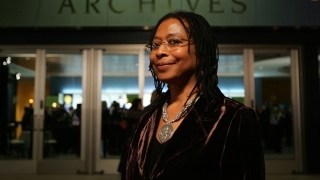 The party -- otherwise known as the BusboysX Dance Party -- runs from 6:30 p.m. to midnight, featuring Alice Walker, Angela Davis, Bill Ayers, Jeff Zinn and some surprise guests as well. Tickets are $45 in advance, available online. The first Busboys location opened in 2005 at 14th and V streets NW; five more locations have since opened throughout the D.C. area. The 10th anniversary bash will be at its Brookland location (625 Monroe St. NE). A rep said the location's top-of-the-line technical equipment and easy access to parking make it a good space to host the party -- and they'll also be able to fit a tent outside. Over the past 10 years, Busboys locations have hosted thousands of poetry events and attracted performers such as Common and activists such as Cornell West. "I wanted to make a place that feels and looks like a D.C. place that you would want to hang out in," founder Andy Shallal said. "My intent was to open one and make it successful." Shallal, an Iraqi-American artist, said people felt a sense of community from the original Busboys and Poets location, and supported openings in other neighborhoods. "D.C. is a political town. It's a very divided town," Shallal said. "We provide a bridge to bring people together. Economically, socially, sometimes politically." Shallal said he hopes the restaurants' progressive and socially conscious atmosphere will continue to have an impact, and continue to be at the forefront of social issues.